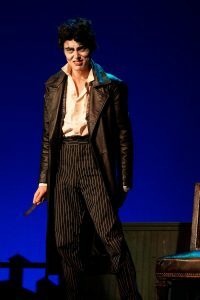 Noah Evans as Sweeney Todd. Photo by James Wirth. He’ll likely be remembered more as the villain. Evans and the cast of Sonoma State University’s latest production deliver a powerful and thoroughly unsettling look at a world where even murder doesn’t stop the ways humans abuse one another. In death, bodies can be turned into tasty meat pies and sold to unsuspecting patrons, who seem to relish them. 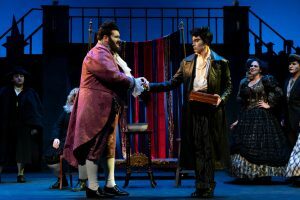 The production’s opening night Thursday succeeded with strong voices, gripping acting and eye-catching costumes and makeup. 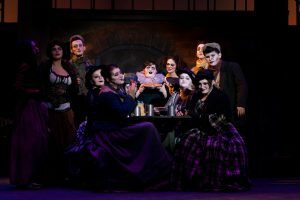 Sweeney Todd seems to have achieved some mythic status in 19th century Great Britain for those rural folk who feared a visit to the vast expanses of London would lead to an untimely disappearance – or worse, some sort of urban cannibalism. Stephen Sondheim and Hugh Wheeler’s version gives us a reason for the fictitious Todd’s murderous ways: A lecherous judge falsely imprisoned the barber and sent him to Australia so that he could acquire Todd’s beautiful wife and daughter. When after 15 years Todd escapes and returns to London, his wife is reported dead and his daughter a ward/captive of the judge. The barber sets about scheming revenge. When frustrated, he shifts to randomly killing customers coming in for a shave. His anger is immense, but not his courage. He rarely confronts an adversary face to face. It’s typically from behind with a razor to the throat. He thinks he won’t care about any of his victims. He’s wrong. Evans embodies Todd, especially as the barber relishes the moments where he’s about to get the revenge he’s so long waited for. The actor’s appearance brought to mind some primping rock star, with pale face, pinstriped pants, long black leather coat and waves of parted black hair that seemed to gain red highlights as the bodies piled up. Cast members. Photo by James Wirth. His partner in crime was Rachel Levin as Mrs. Lovett, the pie maker who concocts the method for disposing the corpses. An excellent vocalist, Levin was all too persuasive in portraying a woman who would do anything to keep Todd under her roof. The story’s other key couple is Todd’s caged daughter Joanna and Anthony, a young sailor who rescued the barber and has been unfailingly kind to him. Hailey Patrick and Jack Adkins give us a reason to care about two young lovers who find themselves sinking under an unending barrage of abuse and injustice. Except for “The Ballad of Sweeney Todd,” few of the show’s songs will likely stick with you. The music seems mostly in foreboding minor keys to highlight the drama. When it does turn melodious, such as in “Not While I’m Around,” it’s mostly to contrast the sweet sounds with the lurking danger for some unsuspecting soul. Nonetheless, the orchestra under music director Lynne Morrow deftly moved the story along, adding to both suspense and sorrow. A tip of the hat to stage director Doyle Ott and the remaining cast members: August Perez, Silas Vaughn, Ryan Contreras, Annie Kessler, Cameron Shellnut, Nate Nolen, Sky Hernandez-Simard, Terra Bransfield, Anastasia Rodriguez, Abbi Samuels, Jennifer Silvera, Shaylan Hammons, Sammie Philp, Avery Wilson, Alex Alonzo, Vivian Knee, Adi Wasserberg, Andrew Cedeño, Marcos Gutierrez and Josh Lovell. The production continues through Feb. 17 at the university’s Evert B. Person Theatre. For tickets and more information, click here. Next up is the Power Lines Festival, featuring four plays written and directed by SSU students. The festival runs April 4-13 in Ives Hall 76. Cameron Shellnut (left) and Noah Evans. 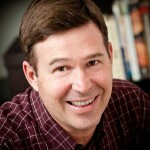 Photo by James Wirth.